I had an early morning call this past Sunday for a Fort Lauderdale fishing charter from Kaiser and Judy who were in town this week. A friend had recommended us here @ All-Inclusive Sportfishing and they wanted to swing by and check out the Marlin My Darlin as they headed over to the beach for a morning walk. They hustled over and met Capt. Kopper and 1st mate Brian just before they cast off on the day?s charter. I spoke with them a second time shortly thereafter while they were still on the beach and they filled me in on what they were hoping for. Their last two charters (Cabo in Mexico) had resulted in very slow fishing for them and no fish. I explained that the bulk of our catches here this time of year are Bonito and Kings, maybe a Tuna, etc. We also spoke about Billfish and I mentioned that certainly not high season here, there were some Sailfish close to shore at the edge of the reef the last two days. The Bonito and Kings would be welcome but a Sail for Judy would be the happy ending after those previous charters in Mexico. As many of you are aware Cabo is a hot spot, but all spots have poor fishing days. We began with the expected Bonitos and secured some decent Kingfish fillets for some dinners and then turned our attention to the Sailfish. 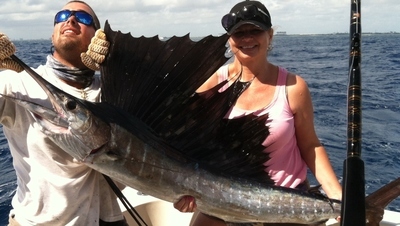 Two kites with live Goggle Eyes were our choice to seriously try to fill the request today and we managed to pull the trigger on this beautiful Sailfish for Judy. We were fortunate today as the Sailfishing did back off from the day before and we made good on our chance on the right short kite bait. Caught and released from what we call ?dead boat? which is where the angler is really one on one with the fish as I didn?t pursue the fish at all with the boat and only pivoted to keep the fish square to the stern during the fight. Nice picture of Judy and 1st mate Brian snapped by Kaiser.